UPDATE: Our billboards were featured prominently by the Associated Press! See here. Donald Trump still demands a racist, ineffective and mind-bogglingly expensive wall on the U.S.-Mexico border — and has even shut down the federal government to accomplish it. Enter the New Democratic House - the adults in the room. Speaker Pelosi is poised to pass six spending bills that will re-open the government with no funding for Trump's bigoted vanity project. Donate today to help us pressure McConnell to oppose the wall and re-open the government. 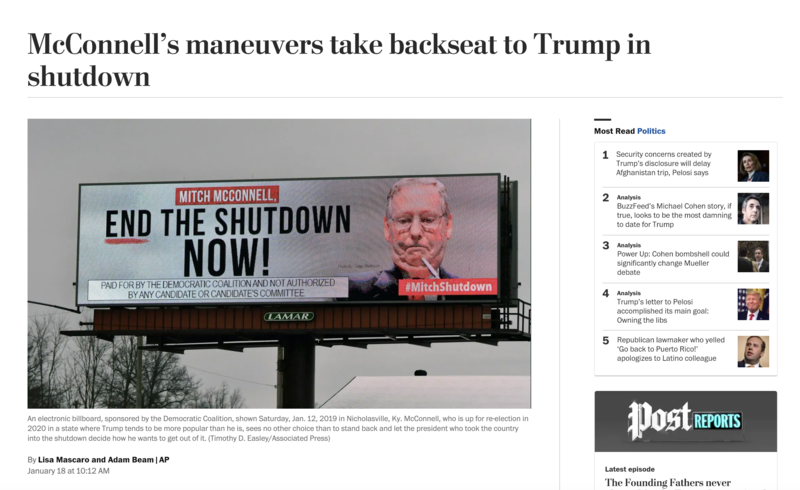 We want to put up billboards in Kentucky that demand McConnell take action to end this shutdown now. These are digital billboards so once we raise enough money, then they can go up within 24 hours or so. After you donate, please send a letter to your Senators here to pass the House spending bills. As the shutdown enters its third week, Trump only digs deeper by claiming most of the federal employees who are not getting paid are "Democrats." This is not normal. The administration is also spitting out pathetic, fear-mongering lies that thousands of terrorists are being apprehended at the southern border - facts that have been easily refuted by statistics from Trump's own government. We can end this shutdown right away if McConnell and enough Republicans join every Democrat in the Senate to fully fund the government, without the outrageous $5 billion for Trump's border wall. It is time to put political partisanship aside and end the government shutdown. The border wall is divisive, expensive and outrageous - and it is unspeakably cruel to hold federal employees hostage because of it. You must stand up to Trump and McConnell now. See our most recent stats report here.